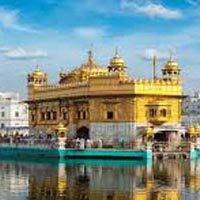 Morning you will met by our representative and transfer to New Delhi Railway station to catch the train to Amritsar. Upon arrival in Amritsar You will met by our representative and transfer to Hotel.. In the evening we journey 40 Kms to Wagha, the border between India & Pakistan. Each evening a very impressive lowering of guards ceremony is performed along with a march past by soldiers of both countries in synchronization to the accompaniment of bugles. The soldiers of both countries wear ceremonial dresses. It is quite a spectacular sight to see the same thing happening on both sides of the border. Overnight stay at the hotel. Following breakfast we visit the Golden Temple, which is the Mecca of Sikh religion .The temple with a shinny pure gold dome, is beautifully situated in the center of a lake (The Holy Tank). And is approached by a causeway .All around the lake are marble walkways and various other temple buildings. The community kitchen, which feeds over a thousand people continuously, is spectacular. The huge utensils to prepare the food and the chapattis (breads) – 20 to 25 at a time – are a mind-boggling sight. However, besides the physical beauty of the place, the strong and tranquil spiritual atmosphere of the place is soul stirring without being overwhelming. The constant recitation of the holy book brings a certain sense of peace to the individual. We walk through the temple complex and try soak in the atmosphere. We would also have an opportunity to meet some Sikh religious leaders who would talk to us about the basic tenets of Sikhism. Just outside the Golden Temple are various shops that sell Sikh religious artifacts like swords (decorative), bracelets, combs, small daggers etc. During the day, we would also visit the Jalianwala Bagh, the martyr’s memorial where thousands of innocent Indians were cordoned off by the British and fired. The well where several Indians jumped to escape the bullets as well as bullet marks and a museum of pictures can be still seen here. We would also be visiting the Golden Temple after dinner. There happens a spectacular ceremony, where the Sikhs put their holy book (Guru Granth Sahib) to sleep. The priests carry the books over their head to place them in a golden palanquin. The book is then carried to an inner chamber in the Palanquin to the accompaniment of bugles and drums and the chanting of the name of the Lord. The palanquin itself is carried by devotees in turns. It is quite a special sight. The book is again placed in the main sanctum similarly in the morning. Overnight stay at hotel. Early morning depart for Manali enroute visiting famous Jawalaji Temple crowned with a Squat Golden Spire, contains a blue gas flame, considerd a manifestation of the Goddess of Fire, Jawalamukhi. After visiting continue drive to Manali via Mandi and Kulu valley. The most charming and beautiful Kullu valley spreads out its charm on either side of river Beas. Kullu was once known as Kulanthpitha, which means the end of the habitable world. Beyond rose the forbidding heights of the Greater Himalayas, and by the banks of the shining river Beas, lay the fabled ‘Silver Valley’. The valley runs north to south of Beas River and is 80 kms long and about 2 kms wide. Upon arrival check into the hotel. Overnight stay at the hotel. Today we cross Rohtang Pass (3978 m), Keylong (3350 m), Baralacha Pass (4890m) with overnight stopover at Sarchu (4253 m), border of the states of Himachal Pradesh (Lahaul) and Jammu & Kashmir (Ladakh). Upon arrival in Sarchu we check in at our tented campsite for overnight stay. Today, the road from Sarchu crosses high mountain Passes of Namika La and Lachalung La to reach the army camp in the Pang valley. The dry barren mountains around Pang are eroded in very spectacular way. They look like giant fortress like structures with spires, pinnacles and windows. From Pang, the road climbs up and reaches a different world altogether. Here is the flat high desert of More Plains, 50-60 km of road bisecting it. This is Rupshu, an extension of Changthang plateau of Tibet. The road then climbs for Tanglang Pass (5415 m), the second highest mountain Pass in Ladakh and then finally reaches Leh. This 475 km Himalayan journey is a visual delight with not one moment of boredom en route. Upon arrival in Leh transfer to your pre-arranged hotel for overnight stay. The two-day festival of monastic dance in June-July has raised the reputation of Hemis particularly high. The festival is dedicated to Guru Padmasambhava, popularly known as second Buddha and responsible for spreading Buddhism in the Tibetan world. Later we drive back to hotel for overnight stay. After breakfast drive to Khardung la, the highest motorable road in the world at 18,390 ft. is around 39 Kms away from Leh. There are two checkpoints on the both sides of the pass. Khardong is the first village of Nubra valley at higher altitude than Deskit and other villages. The views from the top of the pass are amazing. This road carries on to the Nubra Valley (optional). Return to the hotel for hot lunch. Later in the afternoon at leisure for last day shopping and overnight stay at the hotel. After breakfast, check out from hotel and “High Spirit Adventures” thank you for your patronage and ensure a punctual transfer to Domestic Airport to catch the flight for your onward Destination.